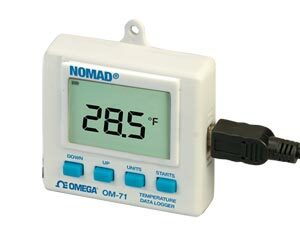 The OM-70 Series of portable temperature and temperature/humidity data loggers are easy-to use, versatile devices which can be used for a wide range of logging applications including coolers, freezers, greenhouses, museums, laboratories, shipping containers, warehouses, environmental monitoring and food storage. These data loggers are capable of sampling as fast as once per second or as slow as every 18 hours. Models OM-71 and OM-72 can store a total of 43,344 temperature measurements in memory. Model OM-73 can store a total of 43,344 measurement points for temperature only or 21,672 points of temperature, humidity and dew point. The model OM-74 thermocouple data logger can store 32,638 temperature samples. Easy-to-use Windows software is included with each data logger. The software is a full-featured program that allows you to set up all data logger functions including sampling rate, logging duration, start mode, logging mode, and high and low temperature alarm values. Once data has been logged, the program then allows you to download data from the logger, plot the data and export the data to an ASCII text or Excel file format for further analysis. • Data summary to read statistics and alarm information in a simplified report format. • Data listing for tabular view of detailed dates, times and values of recorded data. • Graph function displays data in clear graphical format. • Zoom magnifies data with powerful zoom and autoscale functions. • Autoscale function fits data to the screen or allows user to manually enter their own values. • Graphical Cursor displays exact data of any point in the graphical display. • Export data in text or Excel format. • Print graph or text data with print preview and setup options. • Logger configuration allows easy set up and launch of data loggers with immediate or delayed start, preferred sample rate, alarm setup, and custom ID. • Password protected calibration function automatically stores with parameters in device or restores factory defaults. A calibration Window is provided in the software to simplify the calibration procedure. • Status windows display unique ID of logger, battery voltage, memory used, sample rate, duration, alarm condition and logging status. • Menu Bar along the top of the screen provides one click access to software functions. Note: Comes complete with Windows software, operator’s manual on CD, USB interface cable and battery.